This is a fundraiser for Mrs.Asha Sreekumar. 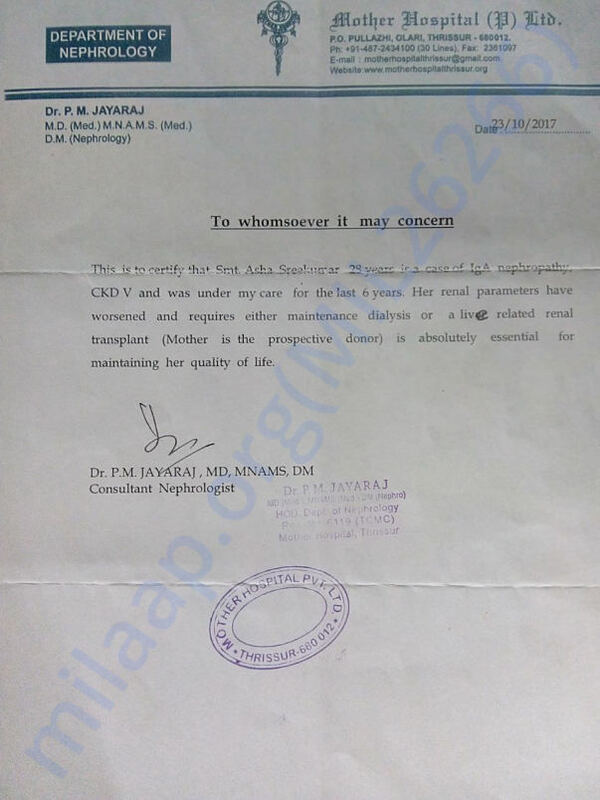 She is currently undergoing treatment for kidney failure and doctor has advised to undergo kidney transplantation immediately. 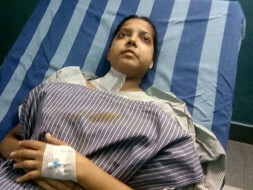 The surgery will cost around 10 lakhs and she is currently seeking help from kind hearted people who can help her in how ever small way possible so that the cost of the operation can be met. She is a mother of a 6 years old boy. Please extend your support in how ever small way possible so that she can undergo the medical treatment and get back to normalcy in life. I have known the emotional trauma the family is going through at the moment. I am creating this fundraising with the faith in humanity and that there are many people out there who can help in this cause. Here is an update on Asha's health. 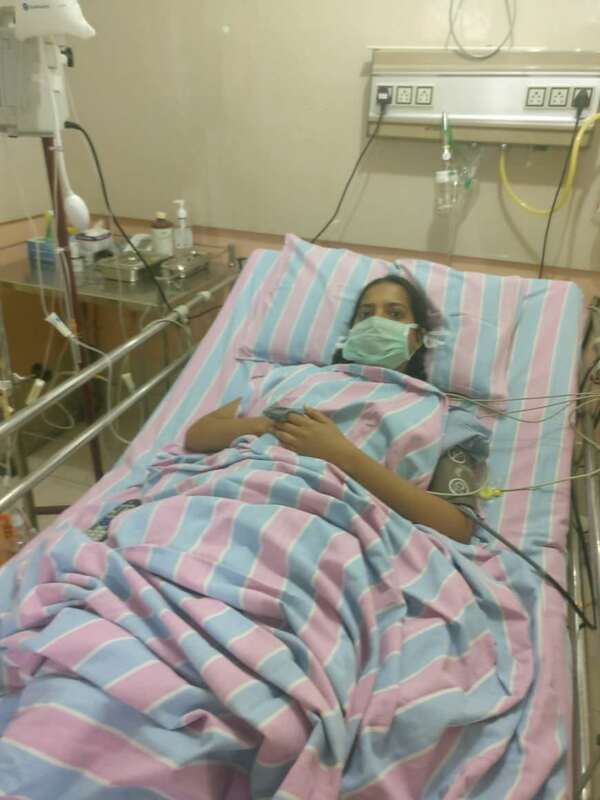 She underwent the kidney transplantation on the 10th. Doctors are happy with the operation outcome and are currently observing her kidney activities closely and are expected to discharge her once the observation is complete which is expected to take few more days. Her mom, who is the donor is also doing good and she is currently shifted to normal ward. I have spoken to asha recently and she has expressed her since gratitude towards each and every one of you guys who supported this campaign. 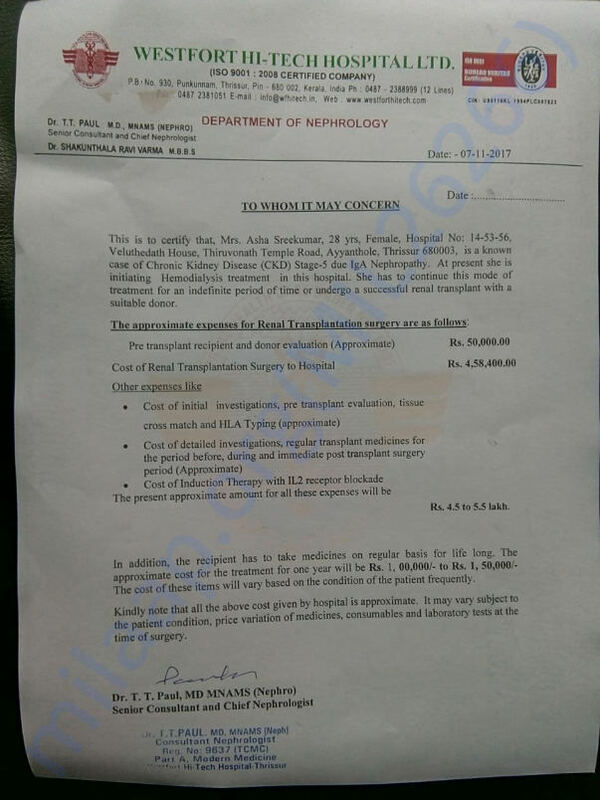 I shall upload the medical expenses bill shortly in this forum. When I started this campaign my only thought was that during this emotional and testing time for her family, I wanted to reach out to whoever I could so that we could collectively reduce the monitory burden on her and her family. And the kind of response I got from my friends and family truly showed us the humanity left in this world and how together we could make a difference in someone else's life. I would like to thank everyone from the bottom of my heart for the support have extended. 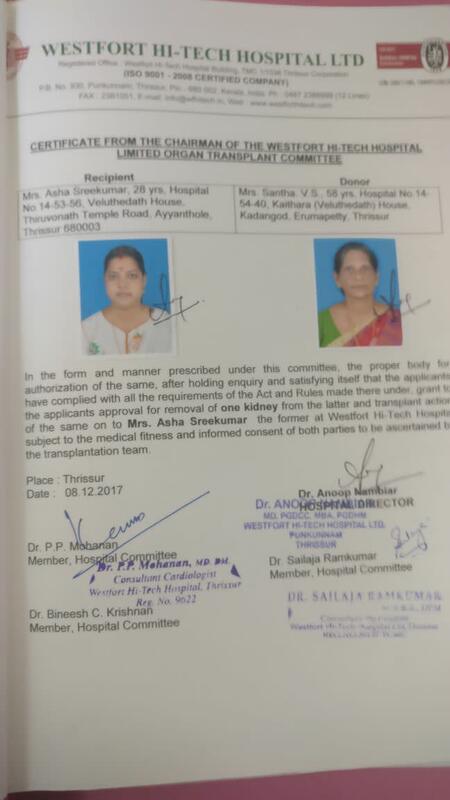 Attaching with this post is the letter from the chairman of west fort hospital organ transplant committee, where she is going to undergo her surgery. Once the surgery is complete we will share with all of you the bills supporting the total medical expense estimate from the hospital. Hoping that your prayers are always with her for a speedy recovery. Asha has completed two dialysis and has to undergo one more dialysis before the surgery. The surgery is scheduled for the 10th of January and she will be admitted on the 7th. We shall keep you posted on the updates. Please continue to support the campaign and pray for her speedy recovery.